Update: Egypt's government has declared a state of emergency that will begin at 10 a.m. ET and last for one month. The reported death toll has continued to rise with the Ministry of Health is now reporting at least 149 killed throughout the country, and over 1,400 people injured. Egypt interim Vice President Mohamed ElBaradei has now also resigned from post following Wednesday's violence. After postponing their plans to end pro Morsi sit-ins earlier this week, the Egyptian government finally made their move to shut down protestor settlements in Cairo Wednesday morning. Egyptian forces moved in with armored cars and bulldozers, launching tear gas into the settlements. Helicopters flew overhead and witnesses also noted hearing the sound of gunfire from both sides of the attack. The Muslim Brotherhood office in London said that the death toll was at least three times that amount and casualty estimates from other Brotherhood leadership spanned well into the hundreds. The Wednesday morning attacks focused on the smaller of the two sit-ins first, clearing the protestor settlement that had sprung up near Cairo University by late morning. Protestors scattered throughout the school's campus and the nearby zoo and botanical gardens. The larger encampment, near Nasr City, proved to be a bit more of a challenge, with protestors throwing rocks and resisting as bulldozers rolled through the camp. During the later portion of the morning Egyptian security forces were successfully closing in on the mosque believed to be a stronghold of the sit-in and a temporary home to several Brotherhood leaders. Amidst the upheaval, police fired tear gas in other parts of Cairo to keep additional Morsi supporters from approaching the encampments and aiding the protestors. 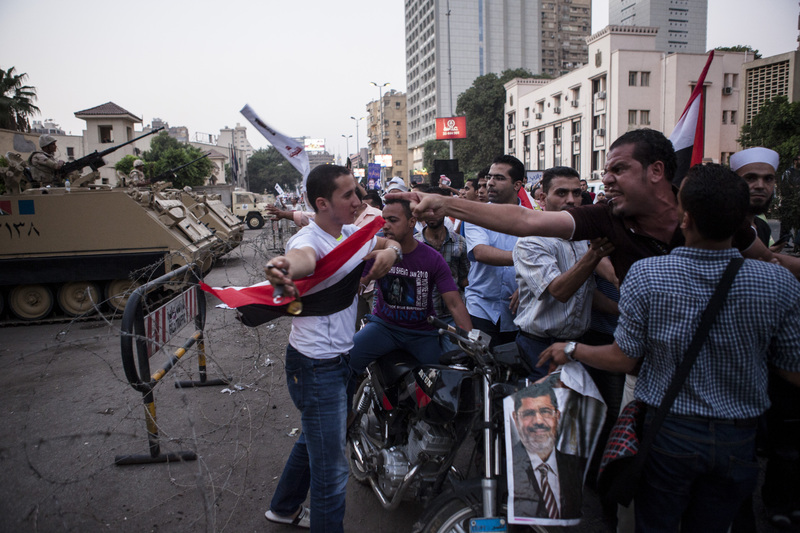 Egyptian authorities said that they would deal harshly with any protesters deemed to be behaving "irresponsibly." The Wednesday morning attacks also provided another opportunity for Muslim Brotherhood leaders to put out the call for supporters. In a statement from the London office, the Brotherhood said, "The world cannot sit back and watch while innocent men, women and children are being indiscriminately slaughtered. The world must stand up to the military junta's crime before it is too late." The raid on the protestor camps comes days after attempts by foreign diplomats to help the Egyptian government and pro-Morsi supports find common ground failed. The two factions have been at odds since the early July coup that ousted the country's first democratically elected president.